We’ve spent the last couple of weeks on how we can go deeper in being “thankful” to God. The focus has been on what God has done or what God has given to us. I hope that these blogs have stirred some ideas and thoughts to help us in the all important spiritual practice of giving thanks. 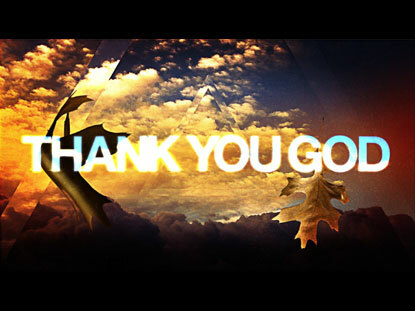 Today, one day before Thanksgiving, I want to encourage us to give thanks to God … for God. Behind all the gifts, blessings, people, and providential circumstances is the One who loves us so deeply. I don’t know why He loves us; that is perhaps the greatest mystery of the universe. But He does. And I am thankful for His love. But God’s love is just the beginning of who God is. In a day and age where the words “Awesome” and “Amazing” are far too overused, they are apt descriptions of the One True God. Here is a list of 50 awesome and amazing qualities of our God, with their Scripture references. I encourage you to read them reflectively, stopping at those qualities that resonate in your heart, and then give Him thanks for who He is. I pray that you and your family have a blessed Thanksgiving. May it be full of giving thanks; not just turkey and trimmings (although that is good – in moderation). I’ll be taking a break from blogging the next few days, but I’ll pick it up next week! Give thanks to the LORD, for He is good! His steadfast love endures forever! Doug, Thank you for taking the time with this blog. Thank you for sharing, for putting yourself in a vulnerable stance to share your life with us. You share not just your victories and triumphs, but your struggles and inadequacies; your humanity. Oh, I thank and praise God for who and what He is to me; His love and mercies are ever unmatchable, beyond all understanding, but I also thank God for HIs children, like you, who allows God to use them in a very public place to be an example and helping hand to others. I thank God, as crazy as this sounds, for my struggles and pilgrimage, for it is by these struggles and encounters with God that has developed who I am today. I thank God for my church and the brothers and sisters who God has placed in my life thus far. You, Doug, and others, God has used to bless and grow me. Thank you!